Intention. Is it possible that the secret to realizing our heart’s desires lies in formulating the correct intention? I practice earth-based spirituality. In fact, I’m a witch, so I also practice magic. Among my other witch friends, intention is the subject of many of our discussions around the practice of magic. I think the assumption is that if we can get clarity about intention and how we can support that intention, nothing will hold us back. I am not sure this is correct, but I have noticed that focusing on intention has helped me to be more clear about myself—my desires, my dreams, my hidden assumptions, and my blind spots. Somehow, that clarity seems to be important in the practice of magic. Astrology is magical and it helps in the process of getting clarity for setting intention. This lunar month, what intention do you wish to manifest? The celestial allies are ready to play along with you, if you are willing to play with them. This lunar cycle we will shift into another season: Fall here in the northern hemisphere. A momentary balance is struck. 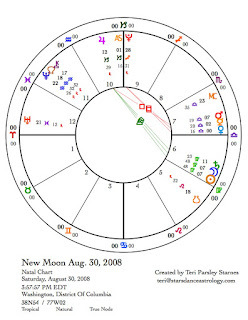 Venus is the ally of this balance and she enters her sign of balance, Libra, on the day of this new moon – August 30, 2008. In the chart for the New Moon, Mercury and Mars are joining Venus in Libra. There is a strong desire to be working for harmony and balance at this time. Relationships are the key. How can you create a balanced stance in your desires this month? These three planets stay close to each other most of this month. They are even closer at the full moon on September 15. Mars is the ally of action. Mercury the ally of communication and learning. Venus invites beauty. These forces can be powerful allies of intention. To invite them into your intention, a “price” must be paid. That price will be an agreement to live by the Libran values of harmony, beauty and balance. The Virgo New Moon is conjunct Saturn in Virgo. [I wrote about Virgo in the July post—Finite Accomplishments.] The Sun, Moon and Saturn are allies of focus. There is strong potential this month to bring a great deal of focus to our intentions if we pay the Virgo “price:” be discerning, keep to a spiritual practice, and be pragmatic. The Full Moon on September 15 illuminates our intentions. 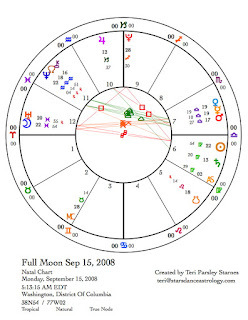 The Pisces Moon conjunct Uranus promises to surprise us in some way, and Pluto is squaring the Sun, Moon and Uranus. Pluto is the ally of deep transformation; Uranus brings vision and revolution. These planets of change will deepen our intentions, perhaps through a test. Pluto encourages us to be real. Uranus encourages us to be daring. How will you dare to really commit to your heart’s desire? Full moons promise to show us a way to integrate the opposing signs of the Sun and Moon. Opposite signs in the zodiac complete each other. Pisces represents Virgo’s missing piece—the reason we sacrifice through our service. This water sign fills our hearts and reminds us why we commit to working so hard on behalf of our intentions. A political aside: The degrees of the Sun and Moon are important. They happen to be at 22 Virgo/Pisces, the same degree of McCain’s Venus and Obama’s Mars. [See last month’s post for more about how the presidential candidates share degrees.] As these degrees are being simultaneously transited, the two candidates seem to be morphing into one. If we want a true choice and a new direction for our nation, we may have to insist that these men differentiate themselves from each other. Jupiter and Pluto change directions. [See June’s post about the retrograde planets of Summer.] At the new moon, two planets are stationary (about to change from retrograde motion to direct). Stationary planets are more potent. The first week of September, aspects between Jupiter and other planets increase Jupiter’s potency. Jupiter is the ally of belief, optimism, and the quest for truth. This planet also has a tendency to blow things out of proportion. Jupiter may prove to be the force that pulls us out of the Libra balance that Mars, Mercury and Venus want to contribute to the month. One thing for sure, far seeing Jupiter wants to shake up complacency. After a summer of mostly retrograde planets, Jupiter might kick things off with a bang and then see what happens. The moderating force here is that Jupiter is in the conservative sign, Capricorn. So, I expect that we will get more pushy around intentions involving professionalism, authority, status or infrastructure. I love it when Pluto stations. Since this ally is the god of the underworld, during his stations, I am able to feel that world under my feet. Ancestral wisdom and deep power are available to us. Mercury retrograde. The ultimate exemplar of retrograde motion, Mercury, is turning retrograde this month in Libra. All those lovely intentions to remain balanced and harmonious will be tested by the Trickster. The trickster makes sure that we aren’t trying to fool ourselves. He will help us in getting clear about our intentions if we sincerely want to be honest with ourselves.